Picture this: a President and his First Lady. They've been married a long time, almost thirty years. On the surface, it seems like a perfect match, but theirs is not a love match by any means. It's a partnership rooted in shared ambitions. Throw in affairs on both sides, machinations that would have made Machiavelli proud, and you have...no, not the Clintons. But it does sound a little like them, doesn't it? Actually, it's Francis and Claire Underwood, the political power couple from the Netflix series House of Cards. The series had already completed four seasons by the time Collin and I discovered it a couple of weeks ago, while he was off work recovering from a stress fracture in his left ankle. We binged our way through all four seasons in a matter of days and are now anxiously awaiting Season 5--which, unfortunately, won't come until next year. It all starts with House Majority Whip Frank Underwood (Kevin Spacey), a South Carolina Democrat who's been promised the Secretary of State position by the newly-elected President. 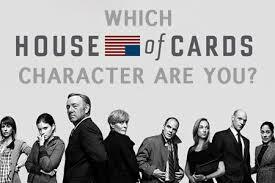 When the President decides Underwood is more useful to his political agenda in Congress, Frank hatches a plot to rise to power by manipulating the players in the political game like pieces on a chess board. Among those stepped on in his climb up the political ladder are Zoe Barnes (Kate Mara), an ambitious young political reporter to whom Frank feeds information she in turn leaks when it will most benefit Frank; Peter Russo (Corey Stoll), an alcoholic congressman from Pennsylvania; Rachel Posner (Rachel Brosnahan), a Washington call girl; Zoe's colleagues Janine Skorsky (Constance Zimmer) and Lucas Goodwin (Sebastian Arcelus); and Secretary of State Catherine Durant (Jayne Atkinson). 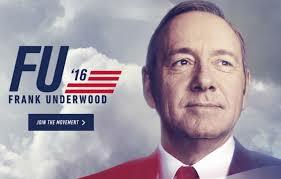 One by one, Frank eliminates everyone who stands between him and the Presidency. Claire's (Robin Wright) own political ambitions eventually threaten Frank's, first when she demands he appoint her US Ambassador to the United Nations, even after Congress has rejected her nomination, and later when she wants to be his running mate in the 2016 election. When she announces she's leaving him, Frank agrees to make her his Vice-President. The pair will stop at nothing to get what they want. Murder? Not above them at all. Using the beheading of a hostage held by Islamic terrorists to gain public approval? No problem. Facing off with a Putin-like Russian President (Lars Mikkelsen), Viktor Petrov? Certainly! Starting a war? Why not! We enjoyed the series tremendously, but it made both of us think. If behind-the-scenes Washington DC is really this bad, is there anyone there worth voting for? I say vote Grumpy Cat 2016. Kevin Spacey looks and sounds like Grumpy Cat! 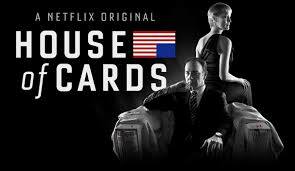 Kevin Spacey and Robin Wright make this a compelling series - even if they behave very badly! It feels so real, doesn't it? Great writing. Oh, yes! And it's easy to get hooked on the show. FU? Pretty much what government an politicians do. Sorry to sound so glum. I suspect that's why the writers gave him those initials. There's a message there. Sorry for the bad new but it is worst. The x knew someone that worked for Clinton since Arkansas. In fact her office was right next door to the Oval Office. If you think you know what was going on then you are so sadly mistaken. You should hear some of what went on. Just awful. Remember Clinton was in the WH when the first bombing of the World Trade Center happened. Remember ? That is one reason why I don't want the lying money grubbing Clintons back in the White House. Plus Hillary as Secretary of State was a fiasco with Bill following her around collecting lots of money. If they get back in the WH when Bill isn't chasing anything in a skirt he will be holding his hand out for more money. Hillary will just lie lie lie and then lie some more. The selling of the White House. Then there is Benghazi, Hillary Clinton repeatedly ignored urgent requests to provide security for the compound. Ambassor Stevens Agent Strickland And Agent Smith. Hours before their death the Daily Mail a paper in the UK reported that Stevens sent a cable describing the trouble coming. But Hillary and Obama did nothing. These men died of fire and smoke. Both should be begging for forgiveness . Instead Hillary blamed someone else and laughed through the hearings. I don't think the Clintons know anymore what is a lie, everything is a lie. opps sorry when on a rant. I'm not surprised by anything those two did or will do. I think Hillary will resort to anything to be the first woman president. I'd love to have a woman president. Just not her. If she thinks she'll get Bernie Sanders' supporters, I think she's going to be sorely disappointed. Most of us aren't registered Democrats, party people. I've seen a lot of calls for a write-in vote. So agree with you. she expected to sail into the White House. I am a registered Democrat but I have had it.... anything even the bonkers Republicans is better than Hillary's party. I voted for Bernie but it was a vote against Hillary. She acts like the Presidency is owed to her. My mantra is "Anybody But Hillary." I haven't seen this show. Will ask Tim if he has. Life imitates art, or the other way around. 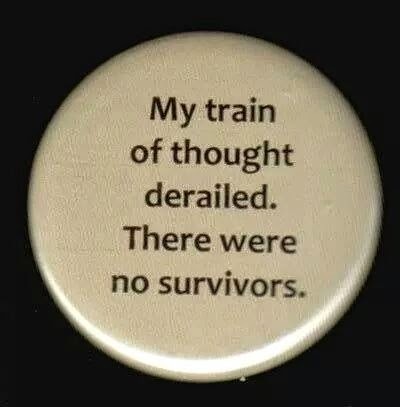 In this case, I'm not such which it is! Entertaining show with some really good writing! I'm sure there's a great deal of truth behind the fiction; there always is! I must admit I always wonder the same thing whenever I watch something like this Norma, that goes for English shows too. Let's hope not but I wouldn't be surprised! I used to love to fly, but the necessary security procedures took the fun out of it. They won't let me scare people anymore!